For more information about such things, see here. Yeah, you read that right. Homonyms are words that sound the same but have different meanings, and often different spellings. It's the different spellings that give Nerdvark nosebleeds. E.g. : red/read (that's an easy one!) 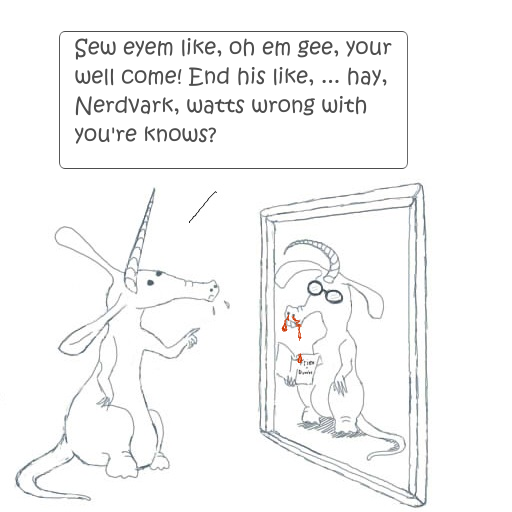 -- Nerdvark's nose bled red blood because he read Nardvark's poorly written essay. More difficult e.g. : your/you're -- Your is a possessive, like his, her, and their. (woah, that's another one!) You're is an abbreviation for you are. Nerdvark's nose bleeds when Nardvark texts him with the phrase "your welcome." Nerdvark replies, "My welcome?" Nardvark doesn't get it. An easy way to remember is to see if the words you are can be used instead. If yes, then you're is your word! Come back next time for more grammar not-see-ism.